Here at Monte Bella Salon in Matthews, NC our stylists stay up to date on the latest beauty trends. Our amazing team listens to our clients and delivers fabulous cuts, styles, hair treatments and more in a fun environment. Stop in and give yourself the treatment you deserve. A veteran to the industry! Mary is kind and considerate, very passionate about her work. She is a color specialist, pampering clients new and old. She strives to grow and learn as trends and technologies change. She believes that education and hard work are essential to success. Mary wants you to feel refreshed, beautiful and confident when you leave the salon. Mary has trained in Hawaii with Paul Mitchell, Florida with Greg Hauptner, Chicago and in salons with Vidal Sassoon Academy. She attends numerous hair shows and salon training. Whether you call or come by to visit Monte Bella Salon, you’ll be greeted by a warm, friendly face. Carol Smith is a native to the Charlotte area. 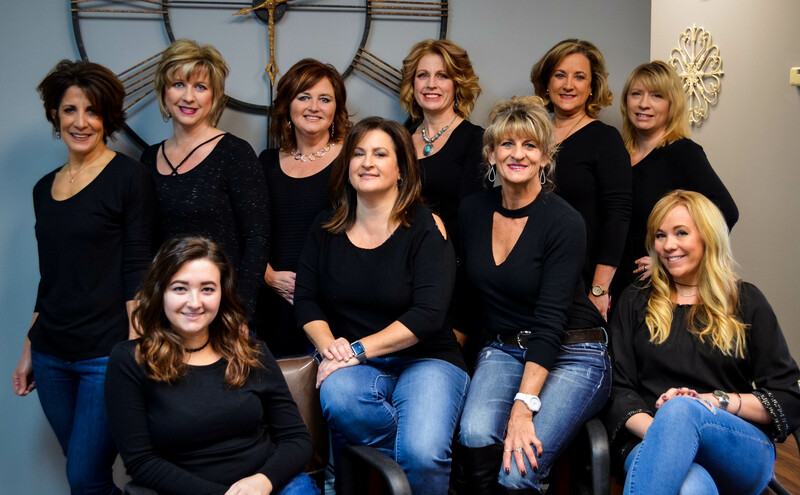 Her strong administrative skills help keep our expert team of professionals organized while her exemplary customer service skills make your experience at Monte Bella Salon enjoyable. Hilary has been a stylist at Monte Bella since 2011. She has been in the beauty industry since 2004. Hilary is certified in the Brazilian blow-out smoothing system, dreamcatchers extensions, and sunlights Balayage. Hilary loves keeping up with the new trends and techniques, and believes education is never ending in this industry. When Hilary isn’t at the salon she enjoys time with her family and dogs plus going to sporting events. Call to make your appointment with Hilary today! She can’t wait to make you look and feel beautiful. Laura is A native of Charlotte and has been doing hair for over 20 years. She was trained by Carmen Cutrona, owner or Carmen Carmen Salon, where she spent several years learning from Carmen and many of his top stylist. LAURA continues to peruse her education most recently a course at Vidal Sassoon. She specializes in cut and color and is always striving to make her clients happy. Shannon has resided in the Charlotte area for over 15 years. She has over 30 years experience in the industry. Shannon specializes in correction color, multi-dimensional coloring, and foiling and contemporary design. She continues to make education a priority. Shannon is very customer service oriented. She is very passionate about making her clients feel and look fabulous. Paula Hicks has been a hair stylist in the Charlotte area for over 20 years. She feels Education is the key to Success. Paula has attended many classes from Sam Villa, Roy Peters, etc. Paula is certified in the Keratin Straightening System Helex and has also worked with Canadian Platform Artist Jeffrey Altenburg from the TV Show “Look-a-Like”. What a Wonderful Profession; making others look and feel their best. Paula Loves what she does and it shows! A native of NC who moved to Charlotte when she was just 3 years old. Holly attended Independence High School where she attended cosmetology school. Holly has been doing hair for 25+ years and specializes in Wella Color & Keratin Complex Straightening System. She also does precision haircuts, hair foiling and also waxing. She has a passion for hair and loves to make people feel beautiful. A graduate of Wilfred Academy, Chris is a professional hairstylist with over 30 years of experience. She is an experienced Goldwell colorist. Her other certifications include Keratin treatments, Brazilian blowouts, and highlighting. A Massachusetts native, Chris lived and worked all over the world, including France and Italy, before settling in Charlotte. As the mother of four girls, Chris has enjoyed keeping up with the latest styles and trends. Madison is the daughter of the salon and has an old soul. She is a native of Mint Hill, North Carolina. She graduated from the Aveda Institute of Charlotte. She loves doing haircuts, color services, and is great at blowouts. Her interests include skateboarding, 80’s music and dogs! Check out her work on Instagram: @gianhairlo! Carrie is a well sought after hair dresser since 1995. She is from Western New York where she finished top of her class. Carrie has received the Goldwell project glossy award and has been published nationally.